This month I’ve been exploring love in all of it’s glorious nuances and applications. We've talked about the importance of loving one's self, the ups and downs of romantic love, and today I’d like to cover eternal love. Love that knows no time limits, no constraints, no bounds whatsoever. 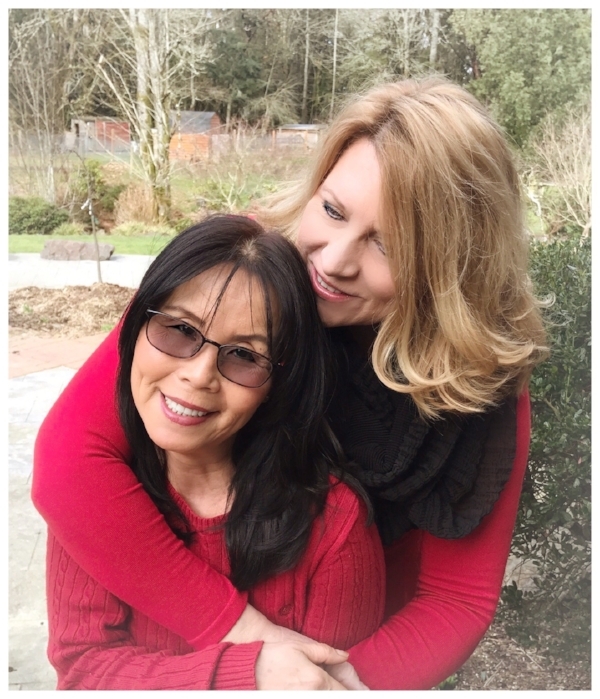 My friend and house-helper, Kimmy, (pictured with me here) is someone who knows eternal love. On Valentine’s seven years ago, she and her husband of more than 30 years, Casey, had a wonderful day shopping, talking, and dining together. After dinner he called out to her from their bedroom. She rushed in to discover him unable to talk, and less than an hour later he died from a brain aneurysm. For the first three or four years after he passed, she was at his grave side nearly every afternoon. It brings her peace to visit often still. I’ve heard her say things like “My husband Casey loves fresh crab” or “My husband Casey is so excited about the World Series”, as if he is only in the next room. She’s not clinging to the past; her life today is full and busy with friends and grandkids, new hobbies, and travel, but her commitment to Casey and the love they had together lives on just as fresh and vibrant as it ever was. Kim and Casey are not the only ones I've met who've had an eternal love. I am fascinated and inspired by such relationships!